Welcome to MailPoet! After installing our plugin, you're ready to go. But where do you start? In this article, we will explain the role of each one of our plugin's pages and options, so you know everything you can do using our plugin. This is the most important page of the plugin, as it contains all your newsletters. Create four different types of newsletters: Newsletters, Welcome Emails, Latest Post Notifications, and WooCommerce emails. Your subscribers are important. After all, they read your emails! Your subscribers are grouped inside lists. These help you segment and target specific audiences with your newsletters. If you run an eCommerce store or a "membership" type of website, you can also send newsletters directly to your WordPress Users. send emails to specific WordPress user roles: Administrator, Author, Contributor, Editor, or any custom role. send emails to customers who have purchased on a specific category. 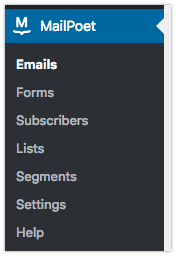 The settings page is the last page on the sidebar menu, but the first one you should look at when experiencing issues with MailPoet. Why? Because it's the source of many common problems. The first thing you should do on the Settings page is to set up how you send your newsletters. This is called your "sending method" and you can configure it on the Send With tab.